Vancouver dazzled with its big city energy. Juneau was more like really good comfort food. Although spread over an area larger than Rhode Island, Juneau’s population is only about 30,000 people. This is very close in size to the small town in which I was raised. After a day of wilderness views, houses along the Gastineau Channel began to appear with greater frequency. Rhapsody of the Seas docked about 1.5 miles outside of town. 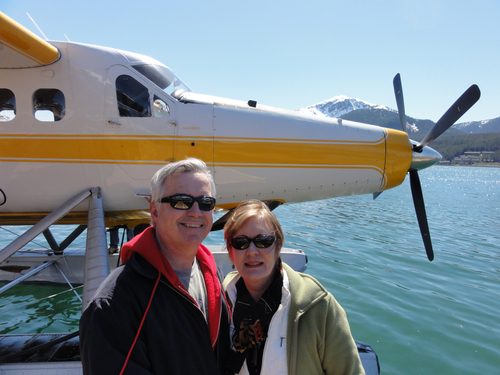 As we sat on our balcony waiting to disembark, we were “buzzed” by a float plane. Minutes later we were on a bus ride to take a “flightseeing” tour on that same plane. The bus driver was a college boy wearing shorts and sandals. The Wings Airways “terminal” was a cute little building on stilts beside an outdoor restaurant and shopping center. The shopping center was quaint, with wooden floors, and just the ambiance you hope you’ll find when visiting Alaska. After embarrassing us all, by writing our weight for the pilot on our tickets, we waited for our plane to land. It was bigger than a de Havilland Beaver, the float plane of my youthful fantasies, but a single engine. The views of the glaciers were a unique experience. I’ve never seen a river of ice before. An especially beautiful phenomenon, we observed was blue glacial ice. As snow compresses into the glacial ice, the crystalline structure changes in a way that makes the ice appear blue. These translucent pools of ice were some of the biggest “diamonds” I ever saw sparkle. Because it was an especially sunny day (the cloud ceiling was high enough), we even got to see a sixth glacier. When we got back to town, we saw two coeds sunbathing on the dock. It was 56 degrees F (13 C)! We walked around town for a bit. While I sat on a bench, I watched a bald eagle soaring high above the ridge that towers over the south end of Juneau. We walked back to the ship excited about our Alaskan discoveries and looking forward to what future ports would present to us. Hehe, “flightseeing!” You always do an excellent job of mixing storytelling, humor, and detailed descriptions of your adventures. (The weight story was too funny.) I really enjoy reading your blog. Alaska is definitely a state that I want to explore in depth. You have provided a great introduction here. What gorgeous places you’ve seen so far… and the wildlife is surely amazing. I can’t wait to read more!